Are you looking for the type of vehicle that has a design that will blow you away? 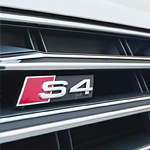 Look into the popular sports sedan that is the Audi S4 and see if it could be everything that you are seeking. The place where exhaust comes out of your vehicle can be a place that others look at and admire. When you have multiple exhaust pipes, people take notice of your vehicle. The Audi S4 has a quad exhaust system. You will appreciate the way that the rear of this vehicle looks because of that. The design of a vehicle affects more than just how the vehicle looks. A well-designed vehicle offers you comfort when you settle into it. The driver's seat of the Audi S4 features a design that is made to help you enjoy many road trips in this vehicle. This seat offers lumbar support and it can be adjusted to keep you comfortable.